1417 x 1417 pixel album cover included with any song purchase. 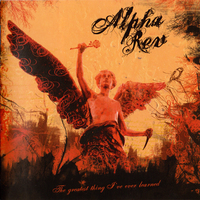 The original release of Alpha Rev's first full-length album. This release contains several tracks that are not included on the re-released/re-mastered record, including the acclaimed track, "Phoenix Burn", as well as "When Did I Wake Up", "Star of Wonder", and "Get Out".